New York Times bestselling author Alethea Kontis is a princess, a goddess, a force of nature, and a mess. She was born in Burlington, VT, grew up in Columbia, SC, and now lives in Northern Virginia with her Fairy Godfamily. Her first stuffed animal was a dog named Toto, her favorite holidays are Halloween and Guy Fawkes Day, and she wishes her birthday was in June instead of January (which is entirely too close to Christmas). Of all the things she's ever written, she considers AlphaOops the most colorful. Q: What have you got against the letter A? Your name has two of them, after all. A: It wasn’t about A…it was actually about Alphabet books in general. Regular alphabet books are so boring. The letters all get a bad rap. I wanted to write a book that would showcase their talents. Q: Is it true you got the idea for this book from a conversation with some breakfast cereal? A: No, it is not true. I don’t eat cereal for breakfast. I prefer sandwiches, cold pizza, and chinese food. They have much more interesting things to say. Q: Where did you get the idea for AlphaOops? A: Orson Scott Card. No, really. I was lying on the couch one morning, thinking about a discussion we had in writing class. Scott had said that when a writer is under pressure to come up with a character’s name quickly, the name will 9 times out of 10 begin with “A” because that’s how the brain files things. Well…what if you were a person who didn’t file things like everybody else? What if your alphabet was like mine? Q: When the letters went home, did they get back into the right order? A: The letters still live in the same houses they always have, but they often get together for the occasional mixer. A: I wrote my first poem when I was eight years old. I wrote my first novel at twelve. I wrote my first fairy tale at fourteen. It took me twenty-seven years to finally get back around to the alphabet and pay homage to the letters that started all the madness. Q: Did you start by writing your name like other kids? A: I actually started out with refrigerator magnets. I didn’t start writing for a few years after that. I didn’t start writing legibly until high school. Q: Why the alphabet and not puppies and kitties and duckies? A: Mixing up letters is fun. Mixing up puppies and kitties is kind of scary. Q: Are you secretly trying to teach kids something with this book? A: Yes. But it’s a secret. If I told you, then I would have to kill you. Q: WHAT is your favorite letter? A: I like them all. Certain days, I like some more than others. What day is today? Q: What is your favorite flavor of Popsicle? Q: Who is/was your favorite Saturday morning cartoon character? A: Without doubt, The Peculiar Purple Pieman of Porcupine Peak (ya-ta-ta-ta-ta-taaa, ya-ta-ta-ta). I was very upset when Strawberry Shortcake relaunched a few years ago without the Pieman OR Sour Grapes. How was Strawberryland supposed to be interesting with no bad guys? Q: Did you fail First Grade because you couldn't get the letters in the right order? 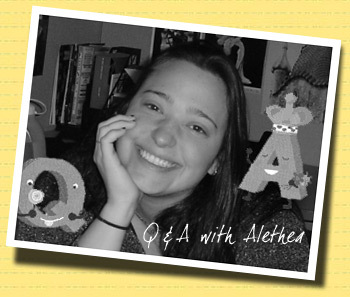 A: No one knew about my unique version of the alphabet because I already knew how to read, just like Matilda. I was also very good at science and math. No one could figure out why I had such a hard time in English class. Glad we finally got to the bottom of that! Q: Have you always been a rebel? A: Yup. When I was five, my best friend was the oak tree in our front yard closest to the road…because I knew it would make my parents uncomfortable. Q: Do you have favorite words that you like to use? Q: Are cursive and block-print letters the same people in different outfits? Or are they different people all together? A: With block-print letters, what you see is what you get. They are nice and sweet, usually. Cursive letters are the dark, mischievous souls of block-print letters. Like chameleons, they take on my personality and steal my secrets, and I have to work hard to make them behave. I sign all my books in cursive. A: I had so many favorites…some of the best were The Monster at the End of This Book (starring Grover), and the Goops Books. Are you a Goop? Q: I've heard the French really love Z... they love Z book, they love Z pictures, they love Z colors. Why do you think that is? A: Who knows? The French love everything. AlphaOops! : The Day Z Went First. Text Copyright © 2006 Alethea Kontis. Illustrations Copyright © 2006 Bob Kolar. To be published in Fall 2006 by Candlewick Press, Inc.